After submitting your resume to many different companies – you finally get the call you’ve been waiting for; you’ve been asked to come in for an interview! While you’re still excited, you slowly begin to panic. You may question whether you can perform in the position. However, you don’t want your potential employer to see your concerns as they want to believe you are confident that you can do well in the position. If the thought of sitting in front of a hiring manager scares you, rest assured, there are things you can do to make yourself feel a little calmer. Get prepared by checking out our interviewing myths and then try the following strategies to help you display nothing but confidence during your interview. 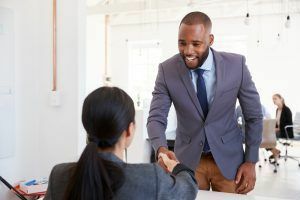 Looking down, looking away, or trying to avoid looking the interviewer directly in the eyes, are all signs of an interviewee who is nervous or lacks confidence. Although you may feel flustered, give the interviewer your full attention by keeping natural eye contact with him or her throughout the interview. Focus on a spot directly between the interviewer’s eyes, making sure to take natural breaks every once in a while by looking down at what’s in front of you. It takes time to begin feeling more comfortable, so just keep practicing until you find the right balance. When individuals become anxious, their blood flows away from the brain, and their cognitive functions can suffer. Before going into your interview, try taking slow, deep breaths. This will help bring the oxygen back to your brain and allow you to begin thinking clearly again. A great thing about this technique is you can do it anywhere without anyone noticing. So if you start to feel nervous in the interview, take a breath and continue the conversation. It’s easy to begin rambling, especially if you’re nervous! However, once you start talking a little too much, you might get off track and say things that aren’t necessary. To avoid rambling, answer each question with one thought or idea, using a sincere tone, and stop there. Don’t worry about being too brief; if the interviewer would like you to explain your answer in more depth, they’ll have no problem asking. Whether it’s pen tapping, leg shaking, hair twirling, or squirming, fidgeting is one of the most revealing ways to show the interviewer that you’re nervous. To help keep yourself in check, place your hands in your lap to avoid any unnecessary arm or leg movements. To help take some pressure off of yourself, remember that you got the interview because the company sees you as a potential candidate. Focus on the attributes that make you great and remind yourself of them before going into your interview. By pumping yourself up, you’ll help take the edge off and give you the burst of confidence needed to approach the situation. Possessing the skills to enter an interview with confidence takes practice. However, with the right attitude and proper guidance, you should be able to keep your nerves under control and earn the job you worked hard for! By attending the LifeWorks Training program, you’ll be able to work with coaches who can guide you and encourage you throughout the 12-week course and beyond. By gaining the knowledge and experience you need for your career, you’ll be able to interview with the program’s employer partners confidently. For more information on how to get a job that was made for you, contact The Jobs Partnership today by calling 407-641-0755.